Dave Birkett of the Detroit Free Press believes Detroit Lions tight end Eric Ebron will be featured more in the red zone this coming season. Ebron, who was the 10th overall pick in the 2014 draft has so far failed to meet expectations compared to his high draft selection. 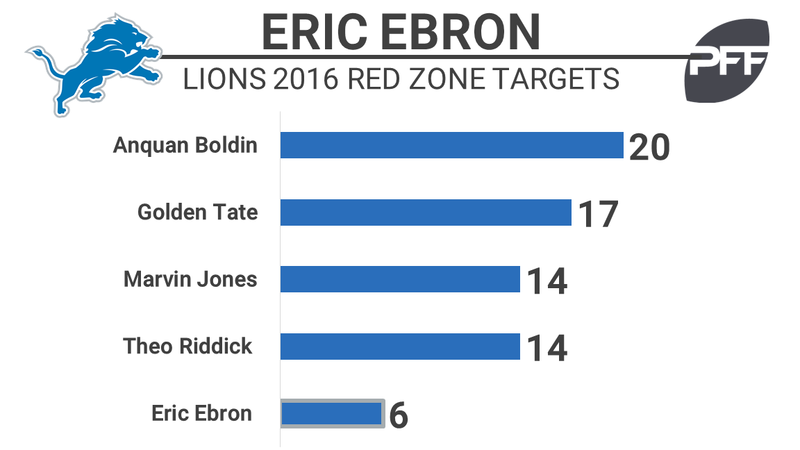 In 2016, the Lions didn’t feature Ebron in the red zone. He had just six red-zone targets on the season and never had more than one in any game. Other Lions skill players — Golden Tate, Marvin Jones, Anquan Boldin and Theo Riddick — all had more than double the amount of targets in the red zone. The Lions have presumably lost their top red-zone threat from a year ago in Anquan Boldin. Boldin’s 20 red-zone targets, 15 red-zone catches, and six red-zone touchdowns all lead the team. With Boldin unlikely to return to the team at this point Ebron could see the bulk of those targets in 2017.